The controller of this card pays 500 Life Points during each of his/her Standby Phases (this is not optional). When this card is targeted by the effect of a card controlled by your opponent, when resolving the effect, roll a six-sided die. If the result is 2 or 5, negate the effect and destroy the opponent's card. 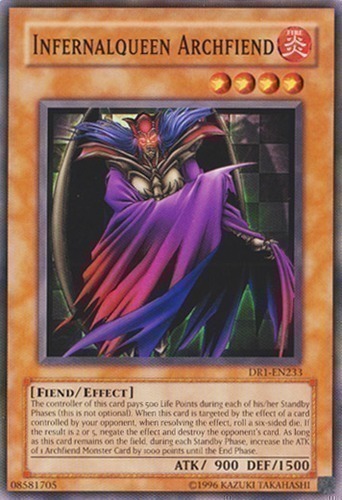 As long as this card remains on the field, during each Standby Phase, increase the ATK of 1 Archfiend Monster Card by 1000 points until the End Phase.